This March, prepare to serve time with the Stalinverse’s newest enemies of the state: Archer & Armstrong! As revealed at ComicsAlliance, Valiant is proud to announce DIVINITY III: ESCAPE FROM GULAG 396 #1 – the next can’t-miss one-shot special torn from the pages of the winter’s visionary comics event! On March 15th, join rising star Eliot Rahal (The Paybacks, The Doorman) and acclaimed artist Francis Portela (Faith) as they sentence religious zealot Obadiah Archer and the unkillable libertine called Armstrong to a fate worse than death: A lifetime sentence in Gulag 396, the deadliest prison known to man. But in letting these two subversive criminal offenders into its walls, has this oppressive Gulag condemned Archer and Armstrong...or itself? 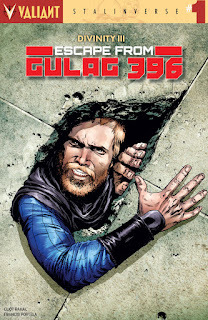 In the Soviet-controlled world of the Stalinverse, there is a place where liberty is sentenced to die...and it’s Gulag 396. A maximum-security prison where the only escape is through death, the gulag is the final stop for all enemies and detractors of the world’s oppressive authority. But when public enemy Obadiah Archer is admitted as the latest inmate, could his gospel of goodwill and optimism be the spark that ignites a new faith in the prison’s population...including the immortal undesirable known as Aram Addi-Padda? On March 15th, be there as Archer and Armstrong challenge Valiant’s violent new reality with a spirit-shaking, standalone tale that will rattle the very soul of the Stalinverse, only in DIVINITY III: ESCAPE FROM GULAG 396 #1 – featuring covers by Adam Gorham (The Violent), Khari Evans (Ninjak), Andres Guinaldo (Nightwing), Ryan Lee (Inhuman) and Kano (Daredevil)! But first… It all begins on December 21st as the Iron Curtain rises over a once-free world in DIVINITY III: STALINVERSE #1 (of 4) – the FIRST ISSUE of the winter’s major comics event from the visionary creative team of New York Times best-selling writer Matt Kindt (4001 A.D.), blockbuster artist Trevor Hairsine (X-Men: Deadly Genesis), Harvey Award-nominated inker Ryan Winn (X-O Manowar) and master colorist David Baron (Bloodshot Reborn, Planetary)! Then: The Stalinverse’s subversive spread continues with the first of four essential one-shots torn directly from the pages of DIVINITY III: STALINVERSE #1 (of 4) on December 28th as New York Times best-selling writer Jeff Lemire (Bloodshot Reborn, Death of X) and superstar artist Clayton Crain (4001 A.D.) re-assign the KGB’s deadliest covert operative from Mother Russia to the mountains of Colorado in DIVINITY III: KOMANDAR BLOODSHOT #1! Next, on January 18th, join the cause of Soviet righteousness as Valiant’s leading legend – the unstoppable X-O Manowar – becomes the supreme fighting force of the CCCP in DIVINITY III: ARIC, SON OF THE REVOLUTION #1 from acclaimed writer Joe Harris (Snowfall, The X-Files: Season 10) and Valiant-exclusive superstar David Lafuente (Ultimate Spider-Man)! Plus, a new kind of hero will rise on February 8th when rising star Scott Bryan Wilson (Batman Annual) and blockbuster artist Robert Gill (Book of Death) summon the Deadside with Shadowman in DIVINITY III: SHADOWMAN & THE BATTLE OF NEW STALINGRAD #1!